OMARgoodness: PSA: Don't Fall For It! PSA: Don't Fall For It! Have you received I check on the mail from a grant you don't remember applying for? And before you go on cashing such a blessing, I suggest you read this and don't start thinking in the many ways you could use that much money! Don't fall pray of scammers and DON'T give away the REAL money you earned breaking your back!!! Free money sounds like a nice break for a struggling freelance student working on his degree, but free money is EVEN NICER when YOU yourself APPLY FOR IT... and GET IT!!! I recommend you check with BBB as soon as you get such "wonderful news" and DON'T make use of that "money." Here's a similar story with different "companies." Just DON'T FALL FOR IT! And another "version" of the scam can be found at Rip-Off Report. Notice the absence of a return address. First up, there's the envelop... No return address. Made me curious as to who would send me a letter from CANADA. I don't have friends in Canada, I know of one person there, but we do all out communicating through email, AND I haven't given him my address. DO research the information provided. In the envelop was this letter... Notice how the "logo" changed from that on the previous cases, but still is the "same" and as you read the letter, remember the elements underlined. They do sound too good to be true, right? 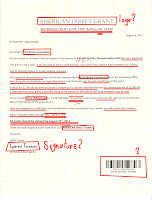 And what about that signature? It's just a different font type, and the addition of the bar code makes it look more official. It is NOT! The signature was spot-printed on. 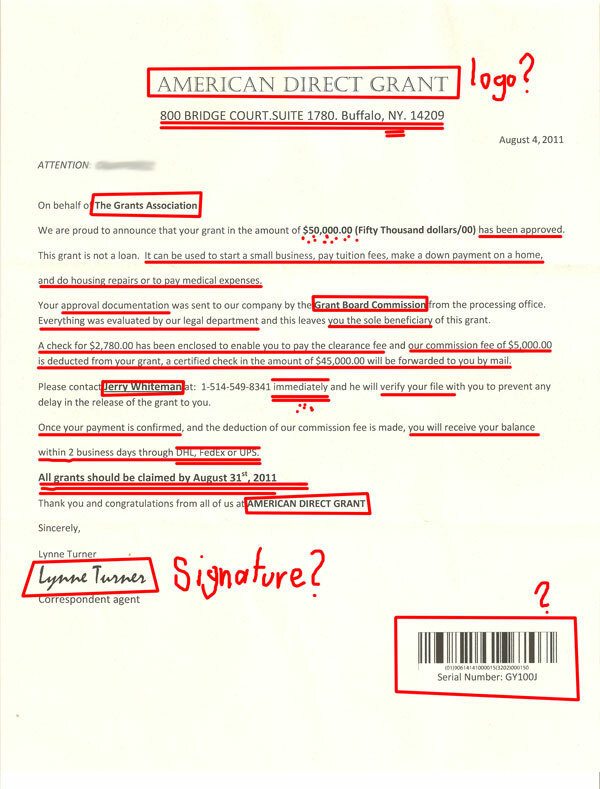 "VOID" becomes visible on copies or scans of the check. At first glance, it looks legit, except for some irregularities on the design and information. Compare the layout of this check to one from your personal ones or any other of the real checks you posses. GET FAMILIAR WITH THEM for when such a scam comes through your door. 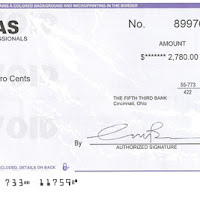 The dimensions of the check are not proportional. Whatever you do, no matter how good the offer is... if they are asking you for money so that you get MORE money... IGNORE THEM and report it to the corresponding authorities. And the BBB. Just to better protect your hard-earned money, be cautious! -Don't give out any money in exchange for more money! Hope this post reach you BEFORE the letter does. And if the letter already did, CANCEL any plans you've made for that money! GOOD LUCK and protect your money, and your family. PS: Check the ads that are relevant to you (and/or make a donation)... every click, every little cent... accumulates. Help me put a dent into tuition costs! THANKS!